There were more surprises on day 2 in Cheltenham as the World Champion, Mark Williams and Neil Robertson. Neil was suffering from a flu and looked very tired. His opponent Xiao Guodong is a very good player but he rarely performed on the TV table. Yesterday he held himself together to win the deciding frame. Mark Williams didn’t play badly, but, just like Ronnie, he played against a player at his absolute best. 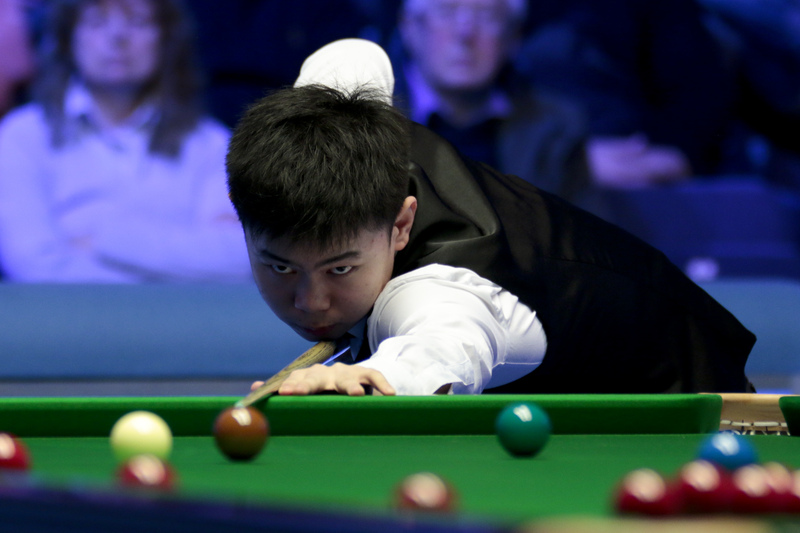 Only that Yuan Sijun is only 18, not an experienced pro like Marco Fu who has been in the top 16 for years. Impressive … and a bit worrying for us Ronnie fans as that kid could well be his last 64 opponent at the Welsh Open next week! It was a great day for the Chinese players – who were celebrating the Chinese New Year; it’s the Year of the Pig – as Ding Junhui also went through with a 4-1 convincing victory over Jack Lisowski. Judd Trump went through but only just. This match showed that he is far from unbeatable. The key however is not to play the type of game that suits him, fast and open, potting fest. Yesterday Stuart Carrington methodical approach, slow going, with lots of safeties clearly frustrated Judd Trump who went cold, looked anxious, became impatient and started to miss all sorts. Carrington could and should have won that match. Judd Trump survived a fight back from Stuart Carrington to win 4-3 at the Coral World Grand Prix in Cheltenham, while local favourite Jack Lisowski was soundly beaten 4-1 by Ding Junhui. 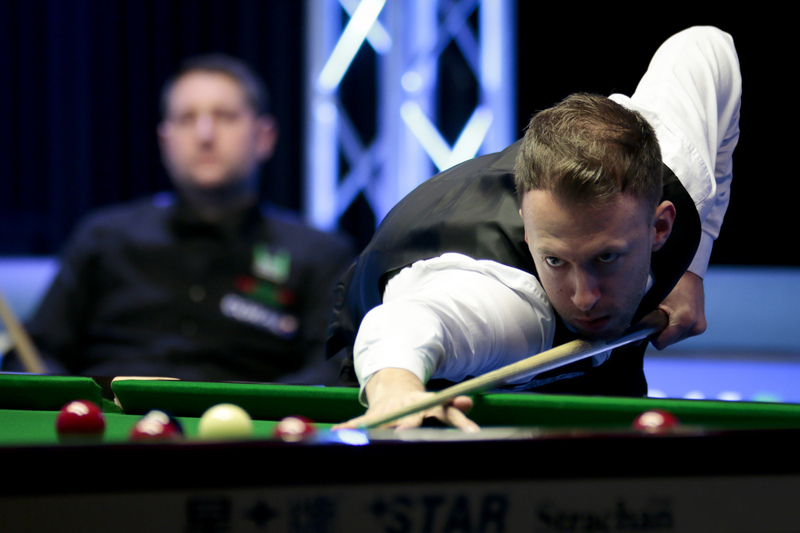 Trump is aiming for his third title of the season having won the Northern Ireland Open and the Masters, and he looked sharp as he took the first three frames against Carrington with top breaks of 92 and 122. His opponent fought back bravely to 3-3 to threaten an upset, and he had two clear chances in the decider but couldn’t take them. World number five Trump snatched victory with a 30 clearance to set up a last 16 clash on Wednesday evening with Tom Ford, who edged out Joe Perry 4-3 with a top break of 79. Ding made it a good day for China as he joined Xiao Guodong and Yuan Sijun in round two. And the 13-time ranking event winner was in sizzling form as he fired breaks of 52, 88 and 126 against Lisowski. 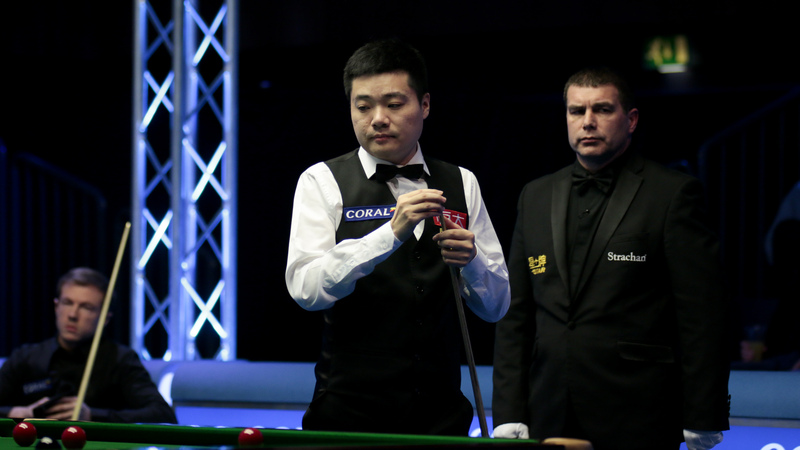 Cheltenham’s Lisowski took the opening frame but his hopes of a deep run in his home tournament were short lived as Ding won four in a row, finishing the match with 349 unanswered points. He now plays David Gilbert or Yan Bingtao on Thursday. Stephen Maguire top scored with 73 in a 4-1 win over Mark King, setting up a match with Chinese teenager Yuan, who knocked out Mark Williams earlier today. I think there’s zero chance that Ronnie plays the China Open. Not only does he not want to deal with the long trip and fatigue, but he would have to go to the qualifiers first, which is something that he (at least for the moment) has decided that he doesn’t want to do anymore. I would not say that‘s a matter of overplaying, jet-lag, etc. Ronnie has to be carefull with his form and have to change his mental approach with the Crucible. As long as he believes to be not able to handle with the pressure of the long distance matches and of being the favourite for the world title, he will feel himself uncomfortable with the Crucible. He should have the same mental shape as in 2013: no pressure, no expectations, but just enjoying his game. Certainly he should avoid the trip to China, but he did so the last year and he played wrong at the Crucible. And obviously he has to practice a lot more than on these days. I usually try to stay clear of all kind of psychological assumptions (I’m not an expert etc), but I feel that all this talk about how he may not play the Crucible last year, but would instead shoot a TV show, how he hates Sheffield and the long matches etc, just result in talking himself into a total dislike of the venue before it has even started. I understand it is tiring, but all that healthy eating he promotes, does not help with stamina? 🙂 And there is some advantage in the long matches to make up for some lapses of concentration or bad streaks best of 7 does not allow. Csilla, I think that it comes down to something quite simple … and complex at the same time. Ronnie’s defeat to Mark Selby in 2014 did hurt, big time, and he’s apprehensive of the Crucible and what it could do to him. He doesn’t hate Sheffield, he likes the city but not during the World Championship. Steve Peters has helped Ronnie, massively, but he can’t simply nullify some feelings and pain. That’s impossible. Yes, Yuan Sijun and Xiao Guodong are based in the new Q House Academy in Darlington, run by the ambitious Thai Chusak Phetmalaikul, with Mike Dunn as head coach. They already have a number of professionals on their books, as well as some promising amateurs. Almost every month they seem to be unveiling a new player, just this week Hamza Akbar, with possibly a VERY big signing imminent. Quite what attracts these young Thai and Chinese players to Darlington, I don’t know! But they seem to have a positive atmosphere and players such as Noppon Saengkham, Eden Sharav, Chen Feilong as well as Yuan and Xiao are getting some good wins. We’re now in a critical stage for Ronnie. He’s had his first failure of the season. Maybe he needs one more tournament win before the World Championship to regain the balance, and it’s not clear whether the China Open will be on his schedule. I would be surprised if he goes to China just before the World Championship. He rarely copes well with jet-lag , so good results are rare, and it can only bring tiredness before the Crucible.